In the chaos of everyday life, there is nothing we need more than just a little peace. This is exactly what is offered to us in Diane Houdek’s new book, The Peace of Christmas: Quiet Reflections from Pope Frances. These reflections begin as Advent begins and runs past Christmas day, ending with the celebration of Epiphany. It is easy to read and doesn’t necessarily need daily devotion, but can be picked up to read a reflection or two when you would like to ponder upon the season of Christmas and it’s true meaning. Each reflection begins with a quote from Pope Francis, and expands upon his idea applying or contrasting it into our everyday lives. The best part is the “present” found at the end of each reflection, “Your Christmas Gift Today.” This encourages us to apply the lesson by given to us with ideas to add to our Christmas preparations and celebrations. If you have something dark in your soul, ask the Lord for forgiveness. Christmas is a great opportunity to cleanse the soul! Do not fear, the priest is merciful, forgiving all in the name of God, because God forgives everything. May there be light in your hearts, in your families, in your cities. And now, with this wish, let us turn on the light. The gift that Houdek gives us for this reflection is to have a lighting ceremony of our Christmas trees and a blessing to say as we gather together. This isn’t something that we have ever done. My husband will bring up the tree, I put up the lights, my kids will help hang the bulbs, then the Christmas tree is just on for the season. It would be wonderful for this year to actually hold a “lighting ceremony” and celebrate the light of Christ pouring down upon us. This book is a wonderful addition to reflect upon the true meaning of the season and quieting our hearts and minds from the everyday rush to get everything done before Christmas comes and goes, along with our family and friends. 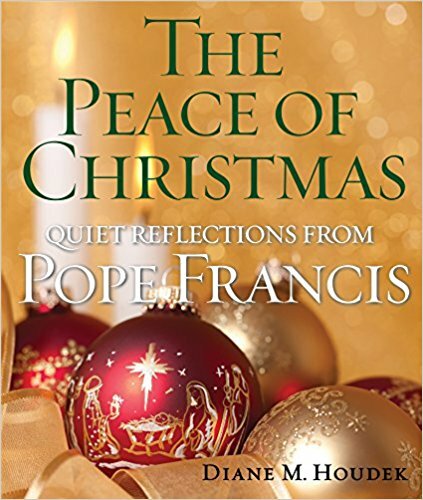 The Peace of Christmas: Quiet Reflections from Pope Frances by Diane Houdek will bring new meaning to the entire Advent and Season of Christmas and will provide our families with a new peace we can only find by seeking the Christ Child in the manger. The Peace of Christmas offers an opportunity to reflect with Pope Francis on the many moods and challenges of one of the central realities of our faith: Our God became one of us, came to dwell in our midst, and began life as we all do, as a tiny baby, needy and vulnerable and dependent on the people around him for his very survival. Advent, Book Review, Catholic Upgrade, Christmas, holy days. Bookmark.